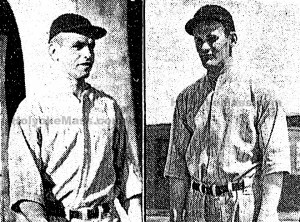 Ed Moriarty, Left and Joe Conway, Right. Edward J. Moriarty and Joseph Conway, both Holy Cross baseball stars, and Harold Hurley, former Villanova athlete, will become coaches of varsity sports at Holyoke High School under a decentralized coaching policy which has been adopted by the Holyoke School Board. The school committee approved the decentralization plan in principle at its last executive session and will be called upon to act formally on the matter at the regular meeting Monday night. Superintendent of Schools William R. Peck announced today that he will recommend the appointment of the above-names men to coaching positions. All three will continue as regular junior high school teachers at the Lawrence School but will assume coaching status at the high school as well. Moriarty, already announced as soccer coach, will be head basketball coach, while Conway, coach of the successful Springdale Turners during the baseball season just concluded, will be baseball coach. Hurley will take over the duties of track coach. Arthur H. Roberts will continue as director of athletics and head football coach. Daniel J. Reagan, veteran staff member, will still be assistant coach of football and will again become swimming coach. Robert Leary will remain on as freshman football coach. All of the above changes have been rumored about the city for the past several weeks. Given official recognition by the action of the school board at its executive meeting, Supt. Peck’s announcement today gives further assurance that the plan will go into effect at once. The plan has been given considerable thought by Supt. Peck for the past several months. All of the men involved in the changes were consulted and not until all agreed to the plan did Supt. Peck announce that he would recommend their formal appointments to the school board.